Stained wood shutters are beautiful, yet we probably sell white shutters in 90% of our shutter jobs. It’s because white plantation shutters are the classic look we associate with shutters and, well, white matches every other color in your house. 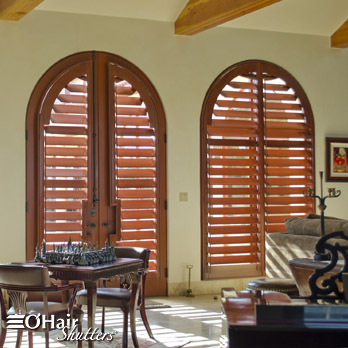 With that said, nothing is more striking than rich stained wood shutters, in colors like Mahogany, Rose or Oak. You can see the natural grain of our wood shutters, and match other wood colors in your house. So keep an open mind, and call today for a Free In Home design consultation and estimate, and we will bring all our beautiful stained wood shutter samples right to your house!